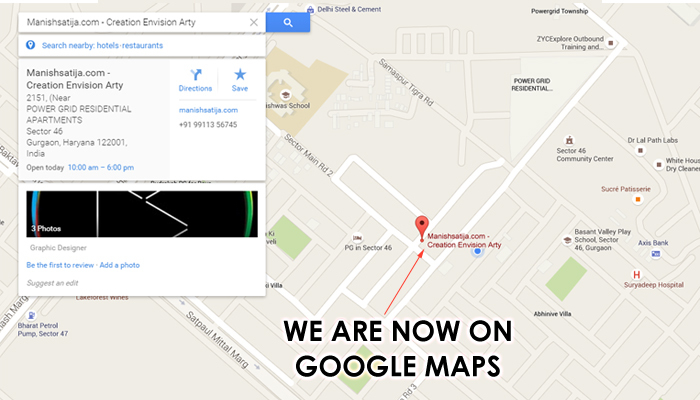 We are privileged to announce that we are now on ‘Google Maps’. This is one of the best platform to register your business ‘whether small or big scale’ one can avail lots of benefits due to the fact it’s fully secure. This is one step getting us closer to achieve our goals. Our hard work and dedication making us to reach towards it. One should always dream high to succeed in achieving the goals. Our creative solutions from logo to branding has successfully covered all the prospects of designing so one can avail creative related services from one platform. Why to run from one shop to another if you have everything available at one station ‘Manish Satija – Creation Envision Arty‘. We always believe in building up strong long term relationship with our clients rather than running behind getting more and more clients. Every businessman comes up with an idea to how to get more & more clients and in return get more revenues. But our idea is to deliver quality instead quantity to our clients, and give better infrastructure to our employees. Work station should be a fun place to work on rather than it’s just a duty to work for. It’s easiest as it said but we believe in implementing such things. So what you all are waiting for , come and join us. Whether looking for services, want to give services – Whether you would like to get educate, want to teach your skills. All are welcome here !